[ His people made him a leader. The empire made him a renegade. History made him a hero. ] - In the year 60 B.C. 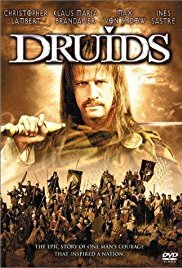 a group of Druids, including the arch-druid Guttuart (Max von Sydow), witness the passing of a comet and interpret it as the sign of the coming of a king for their country Gaul, which has not had a king for a long time. Guttuart goes to Gergovia, the capital of the Arvenes tribe, to attend a meeting of Gallic tribal chieftains. The young boy Vercingetorix, along with his friend the young girl Eponia, sneak into a large cavern where Celtill, Vercingetorix's father and chieftain of the Arvenes, hosts the meeting of chieftains with the intention of proclaiming himself king of all Gauls. When Celtill shows off the crown once worn by the old kings of Gaul, an arrow from two Roman spies (dressed as Gauls) hits Celtill in the back.